Ricoh has introduced the eQuill earlier this summer, and now showed up at the FCC this week. This device is not like just another EReader with an E Ink display, but something done with a new concept and will be targeting a different crowd in the market. 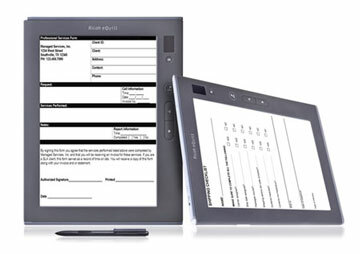 It can actually be called as an enterprise tablet designed to fit into a paperless world. It can actually be connected into an offices server with Wi-Fi or 3G and lets you read and sign documents just like as done on a paper. It is mainly built for health care, police, insurance and other industries where mobile access to documents is important. The eQuill has a 9.7inch screen with 1280 x 825pixels of the E Ink display. The processor provided is a TI OMAP 3621 processor and internal memory of 256MB. It is also provided with an 8GB of storage, which according to Ricoh is sufficient for about 25,000 pages. Well though made this device only for enterprise but it is still interesting to find a 5 Megapixel camera with it. Its dimensions measure around 7.4 x 9.7 x 0.4inches. Its battery is likely to provide about 20 hours of battery life. There’s still no date announced for its release but it will be soon. The price of the model is also not released but it is expected to be $500 or less.